The rich keep getting richer. 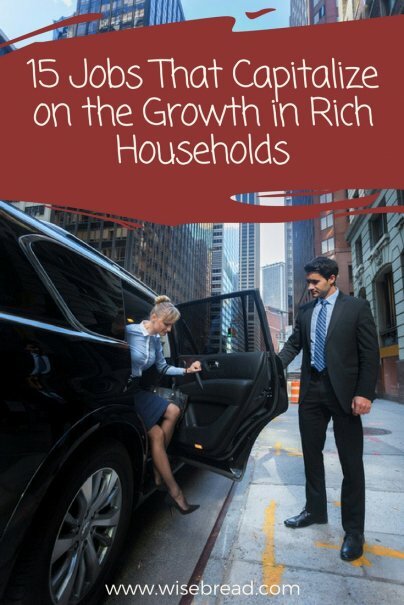 Even among high net worth families, the fastest growing group is the richest — those with $5 million or more in investable assets, according to the Phoenix Wealth & Affluent Monitor. That group grew 8 percent in the U.S. in 2017, and the high net worth market overall (meaning people with at least a cool million in liquid assets) grew by 6 percent. What does that mean for you? Maybe you won't be entering the 1 percent anytime soon, but could you work for the 1 percent? Here are some jobs growing in demand along with the wealthy class. Perhaps stimulated by the popularity of Downton Abbey on PBS, the profession of butler has been on the rise. Times have changed, of course. Women can now be butlers as well as men. And while today's butler may share a lot of the duties that Carson carried out on Downton Abbey, such as supervising the rest of the household staff and decanting fine wines, they must also be comfortable with more modern responsibilities, such as acting as a concierge to score concert tickets, and making sure handheld devices are charged up. The starting salary is for a butler is around $30,000, but goes up steeply from there. Butlers work an average 60 hours a week and earn between $50,000 and $150,000, according to the International Butler Academy. Another source of demand for butlers is high-end resorts and condo developments, which are increasingly offering butler service as a perk. Sandals, for example, offers butlers with their highest-end suites, who provide services such as unpacking suitcases and bringing you drinks poolside. They book tours for you, and even anticipate your desires, such as having a bubble bath and iced Champagne waiting when you return to your suite. Today's butler may also serve as a personal assistant, or that may be a separate job. A PA handles the boss's calendar, keeps track of correspondence, and runs errands, among other tasks. When I was a business reporter, billionaire Larry Ellison once visited our newspaper. I waited with other staff in the lobby while his sports car pulled up to the front door. He got out of the driver's seat, and one of his bodyguards switched over from the passenger seat to go park the car. To me, this epitomizes what it's like to be super rich: You can drive when you want to, but you never have to drive when you don't want to. Clearly, the main job of a private chauffeur is to drive people around. You'll also be expected to keep a household's cars clean inside and out and in working order. You may need to keep the car stocked with what your employer needs, whether it's the morning paper for the ride to work or clean glasses and Champagne for a night out. You might be called upon to sit in the car for hours waiting for the "principal," as servant's employers are typically called. Personal drivers earn about $40,000 a year. Another option for those who would drive the rich is to work for a private car service. While on-demand ride hailing is a new thing for the middle class, it's been available to the rich pretty much forever. Lots of middle income people hire nannies, but the ultrarich have their own style when it comes to child care. It's common for wealthy families to list teaching credentials as requirements for the job. In fact, I have a kindergarten teacher friend who interviewed with a wealthy Silicon Valley family to be the nanny for just one of their children; the other child would have his own nanny, and each nanny would have a car to drive her single charge around in. But that's nothing! Check out this UK posting for a nanny position that went viral: It asks for a baby sitter with a degree in child psychology, self-defense training, and a willingness to travel as often as three times a week among the family's homes on four continents. But with great responsibility comes great compensation: The ad also offers a $140,000 salary and access to the family Maserati (unless you prefer to run family errands in the Porsche). This may be an extreme case, but it's pretty common for wealthy families to take their sitters on vacation; I know several nannies who have enjoyed these trips despite the work involved. If you have high-end nanny cred but would rather not live with a single family, perhaps a career as a vacation nanny is for you. A friend told me she interviewed a nanny once who had previously worked as a "closet nanny." My friend was slightly disappointed to learn that this job entails not secret closet assignations for diaper fetishists, but merely cleaning up people's drawers and closets a couple of times a week. San Francisco company Clean Slate Interiors calls this service organizational maintenance, and charges $160 per hour for two organizers to keep up any kind of system that the company previously set up. Americans spent 70 percent more on pets in 2017 than they did a decade earlier, so it's not too surprising that there are more opportunities than ever providing high-end pet care. It may not be unusual to hire a pet sitter to stay in your home while you're on vacation or to walk your dog during a long workday, but the true elite hire live-in nannies to care for their pets 24/7. Cosmetic procedures in the United States have increased by nearly 50 percent since 2007. This growth in demand has led to predictions of a shortage of cosmetic surgeons. Of course, this job requires years of expensive and rigorous training, but if you happen to be a medical student looking for a specialty, this is one that's growing with the size of the wealthy class. This is not a gardening job (although those are in demand with the growth of rich households as well). A landscape architect has a bachelor's or master's degree, has passed the Landscape Architect Registration Examination (L.A.R.E. ), and knows how to use computer-aided design software. Median pay is $63,400 per year. These professionals spend most of their day at a computer, designing the models for the grounds of grand estates, as well as campuses and public spaces. Different from a butler, this job involves managing any and all properties owned by the employer. Just as an operations manager for a corporation would be responsible for the campus, an estate manager may hire and oversee the grounds crew, make sure an emergency HVAC issue gets taken care of, and ensure security at all times. It's not uncommon for these managers to come from the ranks of corporate America or the hospitality industry, doing the same thing for private households that they once did for whole companies or grand hotels. There is overlap in listings for housekeepers, estate managers, and butlers, but in general a housekeeper's job is going to be more focused on housework. One housekeeper listing offered $30,000 to $55,000 a year, plus lodging, car, a phone, and access to a pool and gym. Required duties included laundry, closet organization, inventory management, and cooking. Any ordinary Joe can sit down with a financial planner and get advice about funding his 401(k), but elite wealth planners provide much more extensive service. They tend to devote their time to just a few clients, or may work exclusively for one family, planning not only for individual households' wealth but also making a long term plan for the children and grandchildren, as well as multigenerational charitable giving plans. A private chef works for one family, making all their meals and sourcing ingredients. Personal chefs — who are accessible to the merely affluent — typically work for multiple families, making and packaging meals for the fridge or freezer. Then there are chefs who focus on catering home dinner parties. All these fancy cooks are in demand as the rich look for ways to save the most finite resource: time. Typically trained in cooking academies, with restaurant experience, being a personal chef to multiple clients can be a nice small business with less overhead and risk than a restaurant. The median pay for a trainer in the United States is only $18 per hour, but if you land a job at an elite boutique gym, you could earn much more. These places charge as much as $50,000 per year and count supermodels among their clients. To work at this echelon, you'll need the best certifications and experience, and will be expected to be able to advise on diet and supplements as well as workouts. Some wealthy gym rats pay two trainers to work with them at once: One to run the workout and the other to observe and give pointers on form. Sure, you could be a regular interior decorator like a schmuck, but why not shoot for the sky (literally)? Private jet decorators design the client's ideal cabin configuration, pick the perfect upholstery, and if they want every fixture plated in gold or a movie editing studio in the sky, they need only say the word. In general, the private jet market has soared. New Flight Charters, a private jet charter company, has reported 12.5 percent year-over-year growth. Whether the jet is owned by just one rich family, time shared, or chartered, the growing popularity of private flight means there are more jobs for pilots, stewards, and maintenance crews as well. The yacht industry was expected to grow a whopping 20 percent last year, and yachts are getting bigger, with the average size now up to 51.6 meters. These mega yachts need crews: captains, mates, deckhands, engineers, stewards, chefs. Salaries range from $2,000 to $25,000 a month, depending on the role. You can even be hired to just live on someone's boat, like a house sitter — but, you know, on a boat. When you're a billionaire, you don't call Microsoft tech support and wait on hold. You leave that aggravation to your family systems administrator. For example, RDV Corporation, established by the billionaire DeVos family to take care of all their household needs, is hiring a Senior Systems Administrator responsible for "ensuring that technology needs are met in family homes, offices, marine vessels, and other locations." Tasks include desktop support, supporting Apple TV, drones, and testing new products. Requirements include a bachelor's degree and five years working in tech support.